When running multiple services and applications on a Kubernetes cluster, a centralized, cluster-level logging stack can help you quickly sort through and analyze the heavy volume of log data produced by your Pods. One popular centralized logging solution is the Elasticsearch, Fluentd, and Kibana (EFK) stack. Elasticsearch is a real-time, distributed, and scalable search engine which allows for full-text and structured search, as well as analytics. 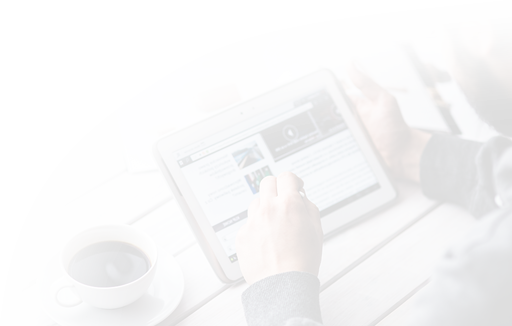 It is commonly used to index and search through large volumes of log data, but can also be used to search many different kinds of documents. Elasticsearch is commonly deployed alongside Kibana, a powerful data visualization frontend and dashboard for Elasticsearch. 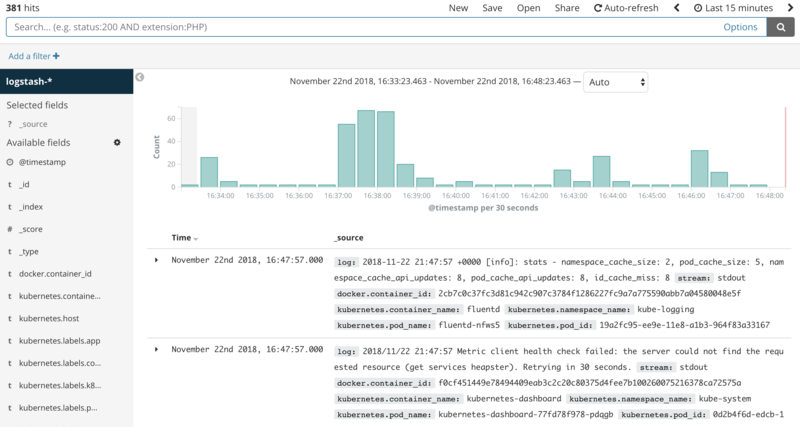 Kibana allows you to explore your Elasticsearch log data through a web interface, and build dashboards and queries to quickly answer questions and gain insight into your Kubernetes applications. In this tutorial we’ll use Fluentd to collect, transform, and ship log data to the Elasticsearch backend. Fluentd is a popular open-source data collector that we’ll set up on our Kubernetes nodes to tail container log files, filter and transform the log data, and deliver it to the Elasticsearch cluster, where it will be indexed and stored. We’ll begin by configuring and launching a scalable Elasticsearch cluster, and then create the Kibana Kubernetes Service and Deployment. To conclude, we’ll set up Fluentd as a DaemonSet so it runs on every Kubernetes worker node. Ensure your cluster has enough resources available to roll out the EFK stack, and if not scale your cluster by adding worker nodes. We’ll be deploying a 3-Pod Elasticsearch cluster (you can scale this down to 1 if necessary), as well as a single Kibana Pod. Every worker node will also run a Fluentd Pod. The cluster in this guide consists of 3 worker nodes and a managed control plane. The kubectl command-line tool installed on your local machine, configured to connect to your cluster. You can read more about installing kubectl in the official documentation. Once you have these components set up, you’re ready to begin with this guide. Before we roll out an Elasticsearch cluster, we’ll first create a Namespace into which we’ll install all of our logging instrumentation. Kubernetes lets you separate objects running in your cluster using a “virtual cluster” abstraction called Namespaces. In this guide, we’ll create a kube-logging namespace into which we’ll install the EFK stack components. This Namespace will also allow us to quickly clean up and remove the logging stack without any loss of function to the Kubernetes cluster. The default Namespace houses objects that are created without specifying a Namespace. The kube-system Namespace contains objects created and used by the Kubernetes system, like kube-dns, kube-proxy, and kubernetes-dashboard. It’s good practice to keep this Namespace clean and not pollute it with your application and instrumentation workloads. The kube-public Namespace is another automatically created Namespace that can be used to store objects you’d like to be readable and accessible throughout the whole cluster, even to unauthenticated users. Here, we specify the Kubernetes object's kind as a Namespace object. To learn more about Namespace objects, consult the Namespaces Walkthrough in the official Kubernetes documentation. We also specify the Kubernetes API version used to create the object (v1), and give it a name, kube-logging. We can now deploy an Elasticsearch cluster into this isolated logging Namespace. Now that we've created a Namespace to house our logging stack, we can begin rolling out its various components. We'll first begin by deploying a 3-node Elasticsearch cluster. One key takeaway is that you should set the discover.zen.minimum_master_nodes Elasticsearch parameter to N/2 + 1 (rounding down in the case of fractional numbers), where N is the number of master-eligible nodes in your Elasticsearch cluster. For our 3-node cluster, this means that we'll set this value to 2. That way, if one node gets disconnected from the cluster temporarily, the other two nodes can elect a new master and the cluster can continue functioning while the last node attempts to rejoin. It's important to keep this parameter in mind when scaling your Elasticsearch cluster. To start, we'll create a headless Kubernetes service called elasticsearch that will define a DNS domain for the 3 Pods. A headless service does not perform load balancing or have a static IP; to learn more about headless services, consult the official Kubernetes documentation. 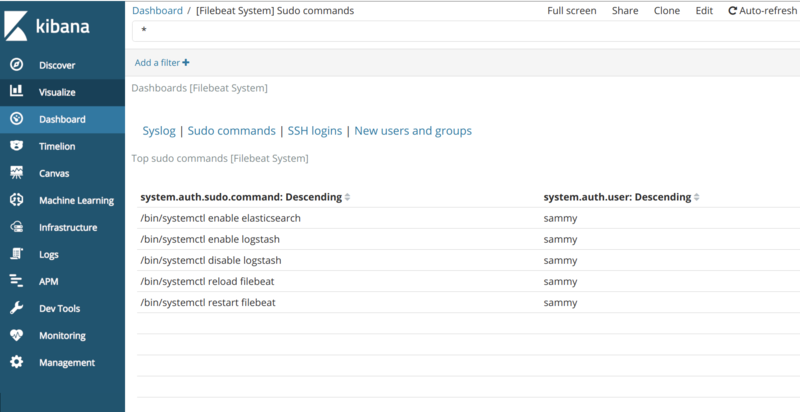 We define a Service called elasticsearch in the kube-logging Namespace, and give it the app: elasticsearch label. We then set the .spec.selector to app: elasticsearch so that the Service selects Pods with the app: elasticsearch label. When we associate our Elasticsearch StatefulSet with this Service, the Service will return DNS A records that point to Elasticsearch Pods with the app: elasticsearch label. We then set clusterIP: None, which renders the service headless. Finally, we define ports 9200 and 9300 which are used to interact with the REST API, and for inter-node communication, respectively. Now that we've set up our headless service and a stable .elasticsearch.kube-logging.svc.cluster.local domain for our Pods, we can go ahead and create the StatefulSet. A Kubernetes StatefulSet allows you to assign a stable identity to Pods and grant them stable, persistent storage. Elasticsearch requires stable storage to persist data across Pod rescheduling and restarts. To learn more about the StatefulSet workload, consult the Statefulsets page from the Kubernetes docs. We will move through the StatefulSet object definition section by section, pasting blocks into this file. In this block, we define a StatefulSet called es-cluster in the kube-logging namespace. We then associate it with our previously created elasticsearch Service using the serviceName field. This ensures that each Pod in the StatefulSet will be accessible using the following DNS address: es-cluster-[0,1,2].elasticsearch.kube-logging.svc.cluster.local, where [0,1,2] corresponds to the Pod's assigned integer ordinal. We specify 3 replicas (Pods) and set the matchLabels selector to app: elasticseach, which we then mirror in the .spec.template.metadata section. The .spec.selector.matchLabels and .spec.template.metadata.labels fields must match. Here we define the Pods in the StatefulSet. We name the containers elasticsearch and choose the docker.elastic.co/elasticsearch/elasticsearch-oss:6.4.3 Docker image. At this point, you may modify this image tag to correspond to your own internal Elasticsearch image, or a different version. Note that for the purposes of this guide, only Elasticsearch 6.4.3 has been tested. The -oss suffix ensures that we use the open-source version of Elasticsearch. If you'd like to use the default version containing X-Pack (which includes a free license), omit the -oss suffix. Note that you will have to modify the steps in this guide slightly to account for the added authentication provided by X-Pack. We then use the resources field to specify that the container needs at least 0.1 vCPU guaranteed to it, and can burst up to 1 vCPU (which limits the Pod's resource usage when performing an initial large ingest or dealing with a load spike). You should modify these values depending on your anticipated load and available resources. To learn more about resource requests and limits, consult the official Kubernetes Documentation. We then open and name ports 9200 and 9300 for REST API and inter-node communication, respectively. We specify a volumeMount called data that will mount the PersistentVolume named data to the container at the path /usr/share/elasticsearch/data. We will define the VolumeClaims for this StatefulSet in a later YAML block. cluster.name: The Elasticsearch cluster's name, which in this guide is k8s-logs. node.name: The node's name, which we set to the .metadata.name field using valueFrom. This will resolve to es-cluster-[0,1,2], depending on the node's assigned ordinal. discovery.zen.ping.unicast.hosts: This field sets the discovery method used to connect nodes to each other within an Elasticsearch cluster. We use unicast discovery, which specifies a static list of hosts for our cluster. In this guide, thanks to the headless service we configured earlier, our Pods have domains of the form es-cluster-[0,1,2].elasticsearch.kube-logging.svc.cluster.local, so we set this variable accordingly. Using local namespace Kubernetes DNS resolution, we can shorten this to es-cluster-[0,1,2].elasticsearch. To learn more about Elasticsearch discovery, consult the official Elasticsearch documentation. discovery.zen.minimum_master_nodes: We set this to (N/2) + 1, where N is the number of master-eligible nodes in our cluster. In this guide we have 3 Elasticsearch nodes, so we set this value to 2 (rounding down to the nearest integer). To learn more about this parameter, consult the official Elasticsearch documenation. ES_JAVA_OPTS: Here we set this to -Xms512m -Xmx512m which tells the JVM to use a minimum and maximum heap size of 512 MB. You should tune these parameters depending on your cluster's resource availability and needs. To learn more, consult Setting the heap size. In this block, we define several Init Containers that run before the main elasticsearch app container. These Init Containers each run to completion in the order they are defined. To learn more about Init Containers, consult the official Kubernetes Documentation. The second, named increase-vm-max-map, runs a command to increase the operating system's limits on mmap counts, which by default may be too low, resulting in out of memory errors. To learn more about this step, consult the official Elasticsearch documentation. The next Init Container to run is increase-fd-ulimit, which runs the ulimit command to increase the maximum number of open file descriptors. To learn more about this step, consult the “Notes for Production Use and Defaults” from the official Elasticsearch documentation. Note: The Elasticsearch Notes for Production Use also mentions disabling swapping for performance reasons. Depending on your Kubernetes installation or provider, swapping may already be disabled. To check this, exec into a running container and run cat /proc/swaps to list active swap devices. If you see nothing there, swap is disabled. Now that we've defined our main app container and the Init Containers that run before it to tune the container OS, we can add the final piece to our StatefulSet object definition file: the volumeClaimTemplates. In this block, we define the StatefulSet's volumeClaimTemplates. Kubernetes will use this to create PersistentVolumes for the Pods. In the block above, we name it data (which is the name we refer to in the volumeMounts defined previously), and give it the same app: elasticsearch label as our StatefulSet. We then specify its access mode as ReadWriteOnce, which means that it can only be mounted as read-write by a single node. We define the storage class as do-block-storage in this guide since we use a DigitalOcean Kubernetes cluster for demonstration purposes. You should change this value depending on where you are running your Kubernetes cluster. To learn more, consult the Persistent Volume documentation. Finally, we specify that we'd like each PersistentVolume to be 100GiB in size. You should adjust this value depending on your production needs. Once you're satisfied with your Elasticsearch configuration, save and close the file. Once all the Pods have been deployed, you can check that your Elasticsearch cluster is functioning correctly by performing a request against the REST API. This indicates that our Elasticsearch cluster k8s-logs has successfully been created with 3 nodes: es-cluster-0, es-cluster-1, and es-cluster-2. The current master node is es-cluster-0. Now that your Elasticsearch cluster is up and running, you can move on to setting up a Kibana frontend for it. 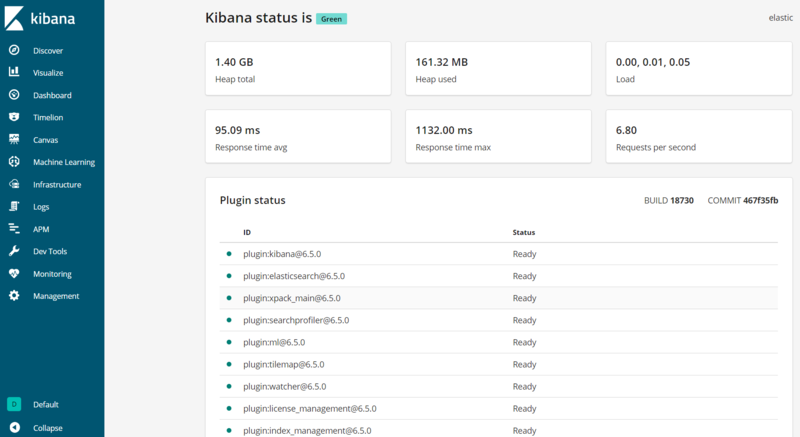 To launch Kibana on Kubernetes, we'll create a Service called kibana, and a Deployment consisting of one Pod replica. You can scale the number of replicas depending on your production needs, and optionally specify a LoadBalancer type for the Service to load balance requests across the Deployment pods. In this spec we've defined a service called kibana in the kube-logging namespace, and gave it the app: kibana label. We've also specified that it should be accessible on port 5601 and use the app: kibana label to select the Service's target Pods. In the Deployment spec, we define a Deployment called kibana and specify that we'd like 1 Pod replica. We use the docker.elastic.co/kibana/kibana-oss:6.4.3 image. At this point you may substitute your own private or public Kibana image to use. We once again use the -oss suffix to specify that we'd like the open-source version. We specify that we'd like at the very least 0.1 vCPU guaranteed to the Pod, bursting up to a limit of 1 vCPU. You may change these parameters depending on your anticipated load and available resources. Next, we use the ELASTICSEARCH_URL environment variable to set the endpoint and port for the Elasticsearch cluster. Using Kubernetes DNS, this endpoint corresponds to its Service name elasticsearch. This domain will resolve to a list of IP addresses for the 3 Elasticsearch Pods. To learn more about Kubernetes DNS, consult DNS for Services and Pods. Finally, we set Kibana's container port to 5601, to which the kibana Service will forward requests. Here we observe that our Kibana Pod is called kibana-6c9fb4b5b7-plbg2. You can now move on to rolling out the final component of the EFK stack: the log collector, Fluentd. In this guide, we'll set up Fluentd as a DaemonSet, which is a Kubernetes workload type that runs a copy of a given Pod on each Node in the Kubernetes cluster. Using this DaemonSet controller, we'll roll out a Fluentd logging agent Pod on every node in our cluster. 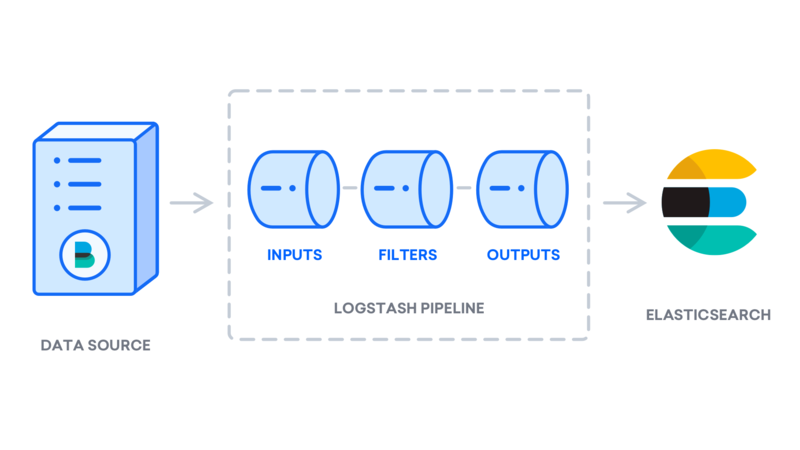 To learn more about this logging architecture, consult “Using a node logging agent” from the official Kubernetes docs. In Kubernetes, containerized applications that log to stdout and stderr have their log streams captured and redirected to JSON files on the nodes. 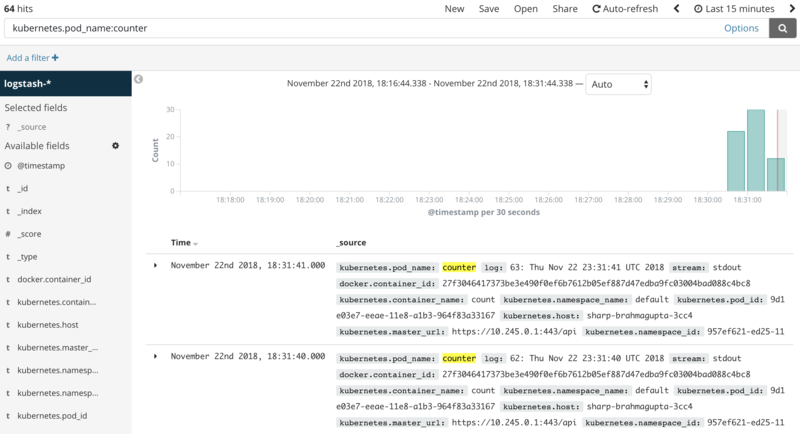 The Fluentd Pod will tail these log files, filter log events, transform the log data, and ship it off to the Elasticsearch logging backend we deployed in Step 2. In addition to container logs, the Fluentd agent will tail Kubernetes system component logs like kubelet, kube-proxy, and Docker logs. To see a full list of sources tailed by the Fluentd logging agent, consult the kubernetes.conf file used to configure the logging agent. To learn more about logging in Kubernetes clusters, consult “Logging at the node level” from the official Kubernetes documentation. Once again, we'll paste in the Kubernetes object definitions block by block, providing context as we go along. In this guide, we use the Fluentd DaemonSet spec provided by the Fluentd maintainers. Another helpful resource provided by the Fluentd maintainers is Kubernetes Logging with Fluentd. Here, we create a Service Account called fluentd that the Fluentd Pods will use to access the Kubernetes API. We create it in the kube-logging Namespace and once again give it the label app: fluentd. To learn more about Service Accounts in Kubernetes, consult Configure Service Accounts for Pods in the official Kubernetes docs. Here we define a ClusterRole called fluentd to which we grant the get, list, and watch permissions on the pods and namespaces objects. ClusterRoles allow you to grant access to cluster-scoped Kubernetes resources like Nodes. To learn more about Role-Based Access Control and Cluster Roles, consult Using RBAC Authorization from the official Kubernetes documentation. In this block, we define a ClusterRoleBinding called fluentd which binds the fluentd ClusterRole to the fluentd Service Account. This grants the fluentd ServiceAccount the permissions listed in the fluentd Cluster Role. Here, we define a DaemonSet called fluentd in the kube-logging Namespace and give it the app: fluentd label. Here, we match the app: fluentd label defined in .metadata.labels and then assign the DaemonSet the fluentd Service Account. We also select the app: fluentd as the Pods managed by this DaemonSet. Next, we define a NoSchedule toleration to match the equivalent taint on Kubernetes master nodes. This will ensure that the DaemonSet also gets rolled out to the Kubernetes masters. If you don't want to run a Fluentd Pod on your master nodes, remove this toleration. To learn more about Kubernetes taints and tolerations, consult “Taints and Tolerations” from the official Kubernetes docs. Next, we begin defining the Pod container, which we call fluentd. We use the official v0.12 Debian image provided by the Fluentd maintainers. If you'd like to use your own private or public Fluentd image, or use a different image version, modify the image tag in the container spec. The Dockerfile and contents of this image are available in Fluentd's fluentd-kubernetes-daemonset Github repo. FLUENT_ELASTICSEARCH_HOST: We set this to the Elasticsearch headless Service address defined earlier: elasticsearch.kube-logging.svc.cluster.local. This will resolve to a list of IP addresses for the 3 Elasticsearch Pods. The actual Elasticsearch host will most likely be the first IP address returned in this list. To distribute logs across the cluster, you will need to modify the configuration for Fluentd’s Elasticsearch Output plugin. To learn more about this plugin, consult Elasticsearch Output Plugin. FLUENT_ELASTICSEARCH_PORT: We set this to the Elasticsearch port we configured earlier, 9200. FLUENT_ELASTICSEARCH_SCHEME: We set this to http. FLUENT_UID: We set this to 0 (superuser) so that Fluentd can access the files in /var/log. Here we specify a 512 MiB memory limit on the FluentD Pod, and guarantee it 0.1vCPU and 200MiB of memory. You can tune these resource limits and requests depending on your anticipated log volume and available resources. Next, we mount the /var/log and /var/lib/docker/containers host paths into the container using the varlog and varlibdockercontainers volumeMounts. These volumes are defined at the end of the block. Once you've finished configuring the Fluentd DaemonSet, save and close the file. This indicates that there are 3 fluentd Pods running, which corresponds to the number of nodes in our Kubernetes cluster. We can now check Kibana to verify that log data is being properly collected and shipped to Elasticsearch. With the kubectl port-forward still open, navigate to http://localhost:5601. Click on Discover in the left-hand navigation menu. 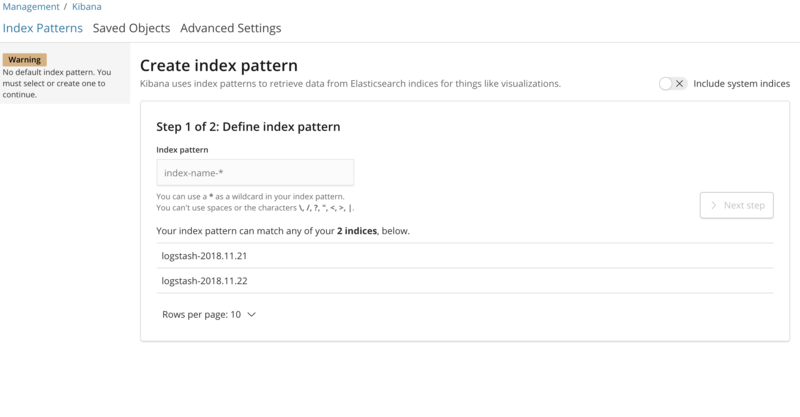 This allows you to define the Elasticsearch indices you'd like to explore in Kibana. To learn more, consult Defining your index patterns in the official Kibana docs. For now, we'll just use the logstash-* wildcard pattern to capture all the log data in our Elasticsearch cluster. Enter logstash-* in the text box and click on Next step. This allows you to configure which field Kibana will use to filter log data by time. In the dropdown, select the @timestamp field, and hit Create index pattern. Now, hit Discover in the left hand navigation menu. At this point you've successfully configured and rolled out the EFK stack on your Kubernetes cluster. 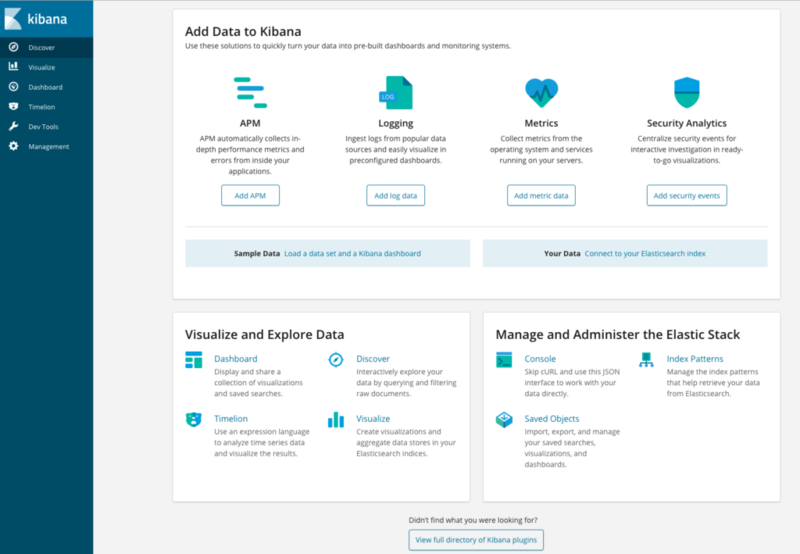 To learn how to use Kibana to analyze your log data, consult the Kibana User Guide. In the next optional section, we'll deploy a simple counter Pod that prints numbers to stdout, and find its logs in Kibana. To demonstrate a basic Kibana use case of exploring the latest logs for a given Pod, we'll deploy a minimal counter Pod that prints sequential numbers to stdout. This is a minimal Pod called counter that runs a while loop, printing numbers sequentially. Once the Pod has been created and is running, navigate back to your Kibana dashboard. From the Discover page, in the search bar enter kubernetes.pod_name:counter. This filters the log data for Pods named counter. You can click into any of the log entries to see additional metadata like the container name, Kubernetes node, Namespace, and more. In this guide we've demonstrated how to set up and configure Elasticsearch, Fluentd, and Kibana on a Kubernetes cluster. We've used a minimal logging architecture that consists of a single logging agent Pod running on each Kubernetes worker node. Before deploying this logging stack into your production Kubernetes cluster, it’s best to tune the resource requirements and limits as indicated throughout this guide. You may also want to use the X-Pack enabled image with built-in monitoring and security. The logging architecture we’ve used here consists of 3 Elasticsearch Pods, a single Kibana Pod (not load-balanced), and a set of Fluentd Pods rolled out as a DaemonSet. You may wish to scale this setup depending on your production use case. To learn more about scaling your Elasticsearch and Kibana stack, consult Scaling Elasticsearch. Kubernetes also allows for more complex logging agent architectures that may better suit your use case. To learn more, consult Logging Architecture from the Kubernetes docs.